This is NOT a standalone story. You need to read The Copper Horse:Fear and Pride for context.This story is set during the events described in Pride and focuses on a side character. 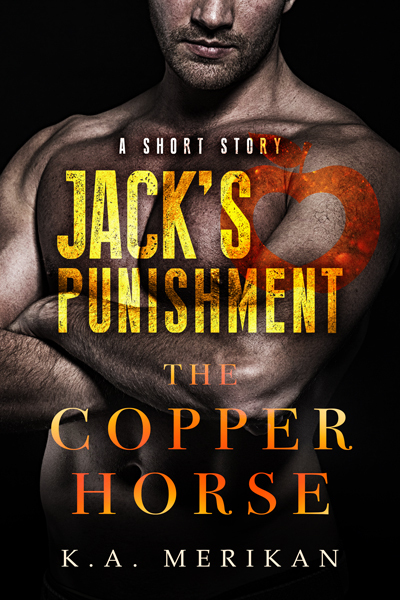 All Jack wanted was to do right by Copper, Master Erik’s ponyboy. Seeing Copper so miserable, Jack tried to help him escape the mansion, but they got caught in the act, and now Jack is sent to the kitchen to help the cook, Mr. Fry as punishment. But Mr. Fry has other plans for the young man he’s waited to get into his hands for quite a while. Mr. Fry shrugged, watching Jack cut the first apple in four pieces, and it made Jack struggle between the fear of being embarrassingly slow and cutting himself. He was certain Mr. Fry would not want blood on the apple, or on the table for that matter. “It’s complicated,” said Mr. Fry and slowly got up. “How so?” Apple. He needed to look at the apple and his fingers, not Mr. Fry and his muscular arms. The hairs on Jack’s forearms bristled, and his heart sped up like a racing stallion. Mr. Fry was right behind him, his chest brushing against Jack’s back. The scent of apples became more intense, and his fingers, so cold from the icy water, were warming up in Mr. Fry’s grasp. Jack couldn’t choke out a word, so he followed the instructions in silence. Mr. Fry took hold of his right hand as well and directed it to quickly and efficiently cut the apple into perfect slices. It took so little time too. But even after they finished, Mr. Fry remained where he was, gently pressing his body against Jack’s. Jack dared to rub his thumb against Mr. Fry’s, his insides melting into sweet jelly. “You’re very proficient,” he whispered. “I am. I have a lot of experience with this,” said Mr. Fry quietly, and the low tone in his voice was like a caress rubbing up and down Jack’s back. “Does it?” asked Mr. Fry, and his hand slowly glided up Jack’s forearm.